Manchester United is one of the biggest club in the world and undoubtedly the biggest in England and are also supported and respected globally. Over the years, we have been blessed with special players and their names will forever be sung and engraved in gold in the history of Manchester United. 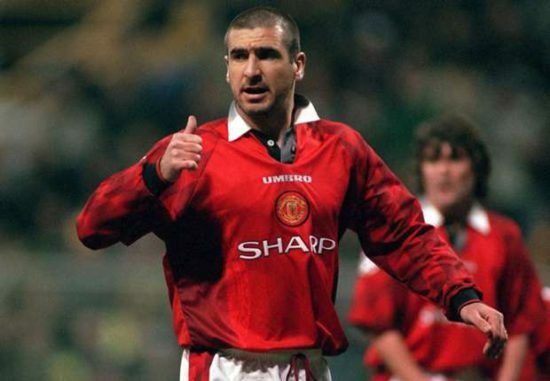 Legendary names such as Sir Bobby Charlton, Nobby Stiles, George Best, Ryan Giggs, Denis Law, Paul Scholes, Ronaldo, Rooney will always come to the mind due to the unprecedented successes they brought to the club, but who can forget the maverick genius Eric Cantona. The France international began his career with local side SO Caillolais and played over 200 games for the club before signing his first professional contract with French side Auxerre in 1986. However, for all his talent Eric Cantona lacked discipline and his first disciplinary issues came into limelight when he punched his teammate Bruno Martini in the face. In 1988, he was suspended for three months after launching a dangerous kung-fu kick at a Nantes player Michel Der Zakarian, but the ban was reduced to two months after his club Auxerre threatened to make him unavailable for the national team. After series of suspension in France, he announced his retirement on the 16th of December 1991, but was advised by 3-time Ballon D’or winner Michel Platini to move to England. Cantona was offered to Liverpool by Michel Platini in 1991, but Graeme Souness rejected the chance to sign him due to the player’s antecedent, he later signed for Leeds United for a reported fee of £900,000 and was pivotal in their title triumph that year. In the 1992/93 season, the Football League first division was rebranded to the Premier League and that year ushered United into an era of dominance in England. With United in need of a prolific striker and lagging behind in the League, the Cantona effect was what we needed and his arrival from Leeds United for £1.2 million was the game changer for United as he was instrumental in our first Premier League title in 26 years. Since Cantona arrival in November, United only lost two Premier League games and won the League by ten points. After winning the League with United, he became the first player to win three successive league titles with three different clubs having won the Ligue 1 with French side Marseille in 1991. In the 1993/94 season, the French man was given the iconic number 7 Jersey which was previously worn by the likes of George Best and Bryan Robson. The French international lived up to the hype and was key for United having won the FA Cup and retaining the Premier League title. He was voted the PFA player of the year and finished as our top scorer with 26 goals in all competitions. However, with United on course for the third league title in a row in the 1994/95 season the famous ‘Kung-fu’ kick happened away at Crystal Palace, Eric Cantona was given his marching orders by the referee for a kick on Crystal Palace defender Richard Shaw. After the famous incident at Crystal Palace, Cantona was banned for up to eight months by the Football Association and was fined £20,000, he was stripped off captaincy by National team manager Aime Jacquet and saw us lose the title to Blackburn Rovers. Returning to the side in 1995/96 season Cantona led us to two successive Premier League titles meaning he won four League titles for us in five years before announcing his retirement at the age of 30. The Frenchman scored 80 goals for United in all competitions, although, he may have left some question marks on his Old Trafford legacy but our Maverick genius ‘King Eric’ will always be remembered as the man who led us to our first Premier League title in 26 years.